I did not make this gorgeous loaf of Challah. I bought it on the West Mall of campus from UT Challah for Hunger for just $5. Challah for Hunger is a national project that empowers college students to raise funds for and bring awareness to national disaster and humanitarian issues by selling bread on campus once a week. The students make the bread themselves (for proof, check out the adorable pictures on their Facebook page) and they sell it every Wednesday from 12-3 PM. The UT chapter sells original, cinnamon sugar, and chocolate chip challah each week for just $5 a loaf, plus a “secret flavor” announced on their Facebook page. Past secret flavors include pumpkin, raspberry chocolate chip, and tomato and garlic. These kids are gourmet! Whoever runs the UT chapter Facebook page is also a clever photo editor. I had originally planned to make baked sweet potatoes with apple persimmon compote for dinner tonight. That idea went out the window as soon as I bought the challah bread. Instead I paired the spicy compote with creamy goat cheese inside the challah for a sophisticated variation on a classic grilled cheese sandwich. I had prepared the compote ahead, so my total hands-on time for dinner tonight was about 5 minutes. Set out butter and goat cheese and allow to come to room temperature(ish). Slice challah. Preheat skillet over medium heat. Generously butter one side of a slice of bread and place butter-side-down on the skillet. Break up goat cheese and distribute it across the slice of bread as evenly as you can; top with compote. Butter one side of the remaining slice of bread and place butter-side-up on sandwich. After sandwich has cooked about 3 minutes on first side, gently flip to the other side using a spatula. Continue grilling until cheese is melted and the second slice of bread is lightly toasted. Repeat with remaining ingredients to make another sandwich. Try not to eat both of them before you can take good pictures for your blog. I showed great self restraint and at least got this one while the sandwich was still in the skillet. 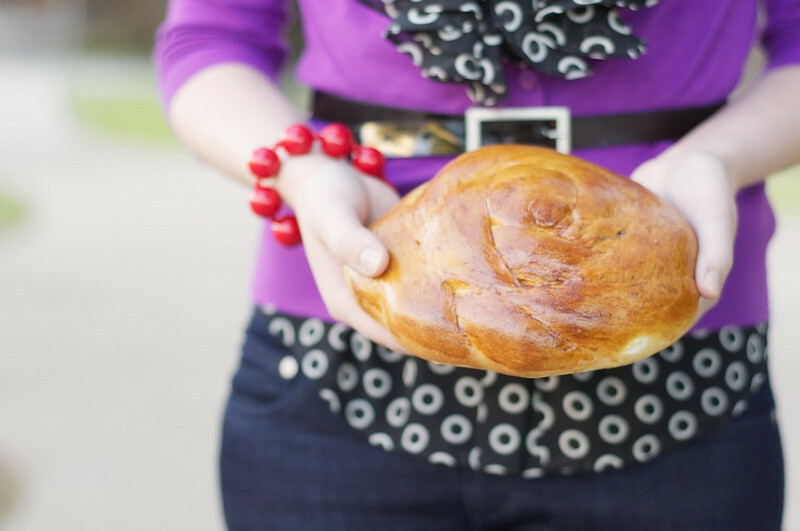 *Special thanks to my friend Amy for taking the challah picture at the beginning of this post and all my outfit pictures for Kendi Everyday’s 30×30 challenge. You can see more of Amy’s photography and keep up with my progress here. 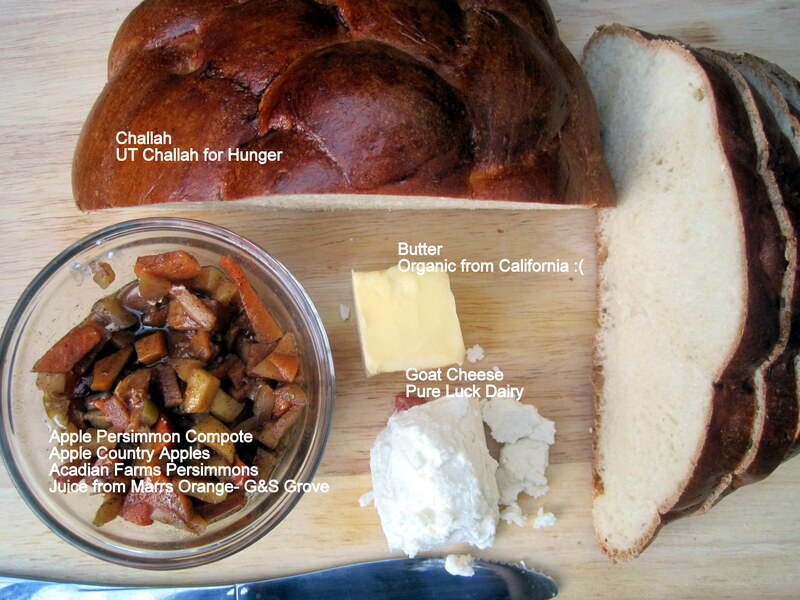 This entry was posted in Fruits, Lunch, Main Dish, Recipes, Vegetarian and tagged Apple, Challah, Cheese, Persimmon. Bookmark the permalink. That sammie looks absolutely wonderful! thanks for the shout-out also. It’s been ridiculously fun! damn that looks so good! i loooove goat cheese. We are ecstatic that you featured us in your blog! Your grilled cheese looks absolutely amazing. I’m glad you enjoy the facebook page since I’m the one who runs it. It’s always good to know that people enjoy our challahs. Thanks again. vassar’s chapter of challah for hunger made absolutely amazing challah. i haven’t had good challah in awhile… i wish i was still on campus. Wow, that looks absolutely incredibly. And it’s for a good cause, which makes it taste all the better. And now I can make it at home any time I want! This sounds so delicious and I’m so glad to hear you support Challahs for Hunger. What a great organization. Maybe you can join forces with them and they can start selling your amazing sandwiches. 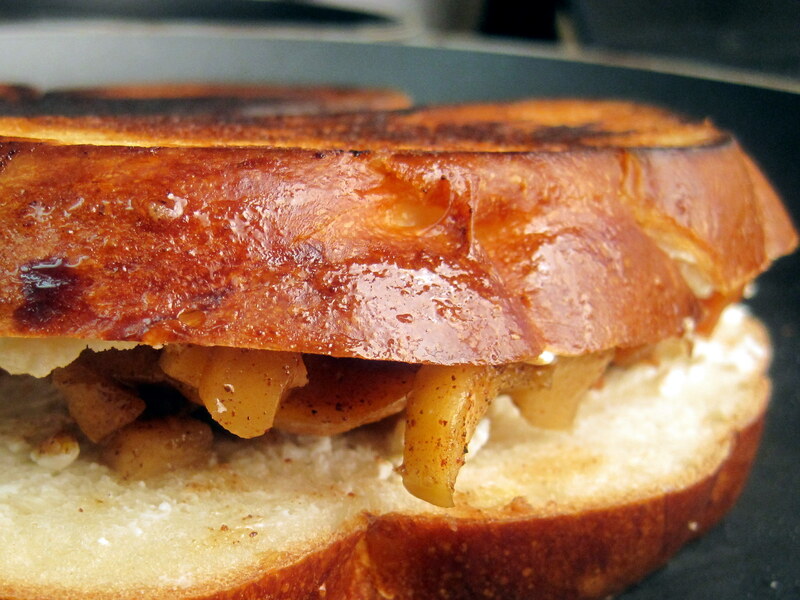 Mmmmm….thinking about grilled cheese for dinner now!